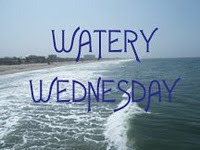 I am very excited to show you these pictures today for Outdoor Wednesday at A Southern Daydreamer and for Watery Wednesday. Make sure you have a look at the other participants. I was introduced to this amazing photographer via an email that unfortunately credited the wrong person for the photos. As I went looking for this person to obtain permission to use his photos (see the discussion on this issue here) it became apparent who the real photographer is. 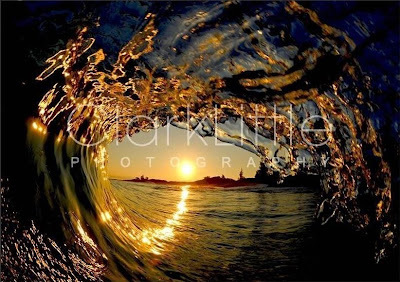 Clark Little was born in Napa, California in 1968. Two years later, a move to the North Shore of Oahu (Hawaii) dramatically changed his future. In the 80’s and 90’s he made his name as a pioneer of surfing at the Waimea Bay shorebreak. Clark had a unique talent for taking off on hopeless closeout shorebreak waves and surviving in one piece. 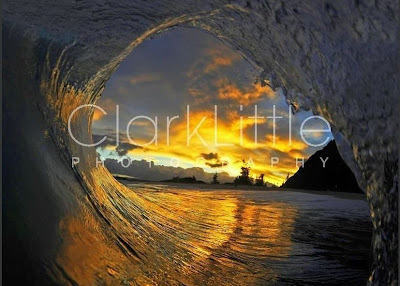 I would like to thank Clark Little for allowing me to use these photos on my site. 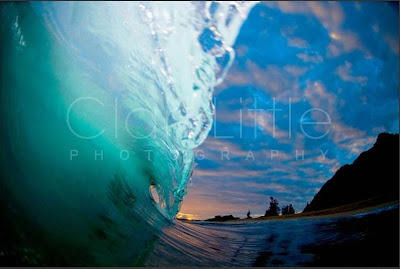 You should take a look at the rest of them at CLARK LITTLE PHOTOGRAPHY. His photos are available for purchase as well as some books and postcard images. What an amazing gift these would make.If you stop by his site tell him you got there from here. I think this helps bloggers get permission for use of photos like these because the photographers can see the up side to allowing bloggers to showcase their photos. What fabulous pictures. 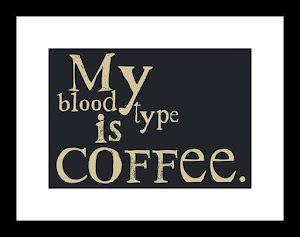 Have a great Outdoor Wednesday. I would love to be able to take pictures like that. He's amazing. 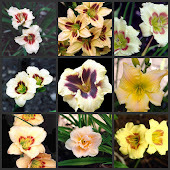 WOW, these are all spectacular, thank you for the heads-up, Kathy. He is a great photographer! His photos are just amazing! 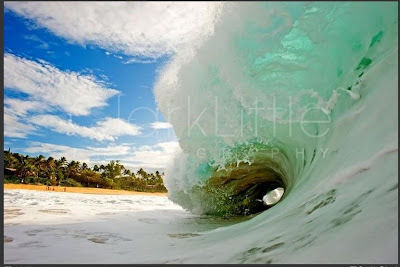 Those wave pictures are beautiful! What a cool perspective to shoot from. These are really amazing photos. So nice stopping by to see your Outdoor Wednesday! These are outstanding shots. You were lucky he let you share them with us. Great job for Outdoor Wednesday. but i have to admit these are way cool! Love...love...love the wave pictures! One of my fav web sites and just so darn gorgeous! Wow....LOVE the curl in that last photo!!! My Wednesday post..."Alligators in the Sewer?" 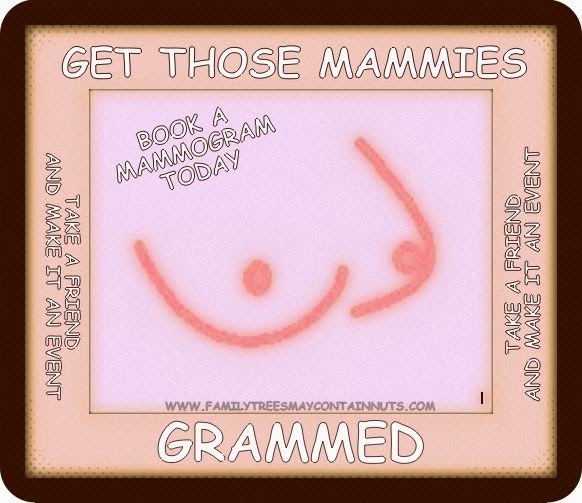 is published...come see if you have a bit of time today. I'd love your visit. i agree with everyone else -- WOW WOW WOW!! gorgeous shots! Gorgeous photos Lucy. 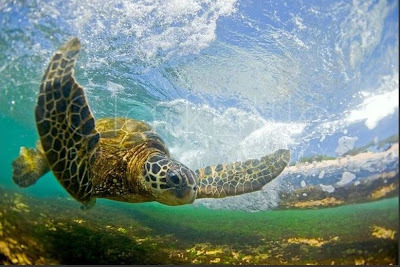 Windows 7 (which I love) comes with theme packs, and the Loggerhead Turtle is actually in one of the packs of desktop backgrounds. Incredible pictures! I can't imagine how he took them. Thanks for sharing them with us. I love the beach, sea turtles and surfing! These photos are amazing and I'm very pleased you ask permission to use them. I read your discussion on photo usage and I see the Creative Commons License in your sidebar (Kudos), but my response was so long I emailed it to you instead of leaving a comment. What AMAZING photos! 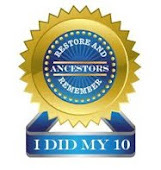 I didn't get to drop by last week but am delighted to find this post in my reader today. Love your valentine too. I picked up the one from Hootin' Anni but haven't had time to make one of my own and/or share hers yet, but hopefully will get around to it soon. Today I'm doing what I can to catch up on blog visits while my laptop cooperates.